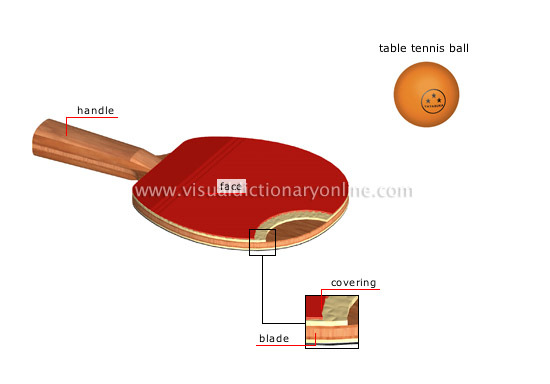 The handle is elongated part that the player grips to control the paddle. 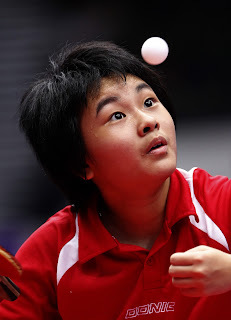 face Rubber-covered surface used to strike the ball; the paddle has one red and one black face. blade Hard flat portion containing at least 85% natural wood. covering Layer of rubber no more than .25 in thick that covers the faces of the blade. table tennis ball Ball made of celluloid or similar material; it is 1.6 in in circumference and weighs 0.09 oz.